From stalwart Starfleet jurors to a minion of miniature-golfing Klingons, this docucomedy takes a hilariously breezy and off-kilter look at the Star Trek fandom menace. Hosted by Denise Crosby of Star Trek: The Next Generation. 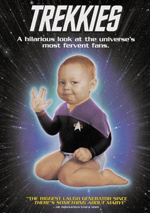 After a recent screening of the Star Wars-related A Galaxy Far, Far Away, I decided to rewatch the best-known of the documentaries to examine obsessive fans: 1997’s Trekkies. Directed by Roger Nygard, Trekkies utilizes former Next Generation cast member Denise Crosby as host. Her travels take us to many conventions and we meet Trek fans all over the US. We encounter Gabriel Koerner, Barbara Adams, Laurel and David Greenstein, the Bourguignon family, Douglas Marcks, Anne Murphy, Joyce Mason and Evelyn DiBiase, Erik Larson, Daryl Frazetti, James T. Kirk (not his birth name), Richard Kronfeld and J. Trusk. In addition to these fans, we also hear soundbites from folks connected to Trek and other notables. We find notes from Trek linguist Dr. Marc Okrand, consultant Richard Arnold, makeup supervisor Michael Westmore, convention promoter Pat Rimington, Voyager co-executive producer Brannon Braga, astronaut Buzz Aldrin, Voyager co-creator/executive producer Jeri Taylor, and actors Walter Koenig, James Doohan, Leonard Nimoy, Grace Lee Whitney, DeForest Kelley, Nichelle Nichols, George Takei, Michael Dorn, John de Lancie, LeVar Burton, Jonathan Frakes, Majel Barrett Roddenberry, Brent Spiner, Kate Mulgrew, William Shatner, Chase Masterson, Ethan Phillips, and Wil Wheaton. When I reviewed Galaxy, I criticized it mostly for two reasons. For one, it lacked clarity and took a rambling, nearly incoherent path, and for another, it viewed its subjects in a smug, condescending manner. In regard to the first category, Trekkies should seem even less well integrated than Galaxy. At least the latter organized itself around the countdown to the opening of The Phantom Menace. Trekkies boasts no similar overriding construction; it just examines Trek and its fans with no obvious pattern. Nonetheless, Trekkies feels quite coherent. It moves along well and connects together smoothly even though it jumps about from one spot to another with alacrity. Galaxy suffers from jarring, jerky editing, while Trekkies zips through its participants in a way that makes it feel surprisingly tight. It also doesn’t look down on its subjects – and believe me, it sure could. Star Wars fans have a sense of perspective that Trek buffs lack. 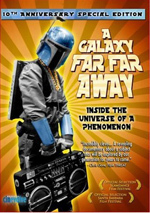 When you talk to Star Wars lovers, they say, “I know this is nerdy but what the heck? It’s fun!” When you talk to “Trekkies”, they say, “This is normal and I don’t see anything unusual about it.” Star Wars fans love the flicks but “Trekkies” live their obsession. Which makes them much more ripe for mockery, so I’m glad Trekkies maintains a pretty even-handed tone. Even though we find quite a few truly obsessed fans, only a few seem to veer into actual “kook” territory. Murphy’s lust for Spiner has “restraining order” written all over it, and the fact that David Greenstein would happily alter his ears to look Vulcan scares me a bit. The fact that some dude legally changed his name to “James T. Kirk” also seems just a wee bit… odd. All of them pale in comparison to Barbara Adams. She gained some national infamy in the mid-90s when she sat as part of the “Whitewater” jury. Adams came to court everyday in her Starfleet uniform and failed to see any reason someone would view this as odd. She insists that others refer to her as “Commander” since she’s a “commander” in her local “Starfleet chapter” and she views this all as totally normal. I’m all for “live and let live”, and I’m sure Adams is a nice person, but she really is a bit of a kook. I wonder if other “Trekkies” resent her because she gives them all a bad name. To reiterate: she does nothing inherently wrong, and she seems to be an upstanding citizen. However, she also comes across as an obsessed fan who lacks the ability to differentiate between real life and fantasy. Adams makes a weird analogy in which she claims that folks wear football and basketball uniforms in public so why shouldn’t she go to court in her Starfleet garb? For one, Barbara, no one walks around town in full sports uniforms. They might wear jerseys of their favorite teams, but I’ve never seen someone at Starbucks done up in pads. For another: no one with half a brain would wear football or basketball uniforms as part of a jury. That’s a different setting, and the sight of someone in a Starfleet outfit turns the court into a circus. I know Adams didn’t intend to do that, but that’s where her apparent inability to separate fantasy from reality comes into play. A better-adjusted person would understand why you shouldn’t dress up like a character from Trek - or Star Wars, or Lord of the Rings, or The Matrix - when you sit on a jury. One observation about another difference between Trek and Star Wars fans: Trek seems to attract more women. It’s a stereotype that only nerdy male get into the various series. Heck, one of those guys even makes a comment – perhaps tongue in cheek, perhaps not – that their most recent fan gathering actually attracted a girl! A glimpse of the footage shows plenty of females, though Trek seems to attract an unusually high level of androgynous ones. Why that should be escapes me, but I must admit that female Trek fans often fall into one of two stereotypes: they’re often either boyish or they’re heavyset. Exceptions do occur, of course, but expect those two traits to dominate. Of course, the guys aren’t usually Brad Pitt doppelgangers, either. They often fall into stereotypical modes as well, though the film doesn’t ever dwell on any of this. Galaxy would shove our faces in the obvious nerdiness of its participants, but Trekkies lets them be without comment. This means it actually portrays these folks as human beings. Quirky human beings to be sure, but they’re given much more of a humane edge. The film wants us to understand them better and not simply view them as circus freaks. One major difference between Trekkies and Galaxy comes from the fact the former includes massive participation from those involved with Trek. In Galaxy, you won’t find a single comment from anyone who worked on any of the films. Oh, they almost got a soundbite from Samuel L. Jackson, but they were so inept they left off the audio recorder. By contrast, Trekkies comes packed with insights from Trek-related personnel, and they really add a lot to the package. They help put the obsessive fans into perspective. Sure, they offer some stories of real loonies – like the one who wanted a sample of Doohan’s blood, and another who tried to get the “Q Virus” – but they also paint a portrait of the fans as nice people who do a lot of good for the world. And that’s what helps make Trekkies more than just mean-spirited sideshow. Maybe some people don’t like the presence of the Trek folks – maybe some think the film would be more “objective” without the Trek Stamp of Approval. I disagree, and I think it seems much more objective than a snarky poison pen letter like Galaxy. With Trekkies, we get a consistent fascinating look at the world of obsessive fans, both for better and for worse. It’s a strong documentary. 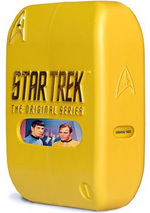 Trekkies appears in an aspect ratio of 1.33:1 on this single-sided, single-layered DVD; due to those dimensions, the image has not been enhanced for 16X9 televisions. A mix of issues cropped up in this inconsistent presentation. Sharpness mainly came across well. Occasional shots appeared slightly ill-defined, but those didn’t occur frequently. For the most part, the program seemed acceptably distinctive, though not well great definition. No problems with jagged edges or shimmering occurred, and edge enhancement remained absent. Source flaws were the biggest issue. In low-light shots and interiors, grain and artifacts became prominent. I also witnessed various instances of specks, marks, hairs and other debris. These weren’t heavy, but they popped up more often than I’d like. Colors went for a natural look, and they seemed reasonably developed. The tones were fairly rich and full. Some flatness affected them – especially in interiors - but not badly, as the colors generally looked clear. Blacks were moderately deep but could be somewhat muddy, and low-light shots tended to be somewhat dense, though they maintained acceptable clarity; the graininess affected that side of things the most. Overall, the image seemed clear and watchable but not anything special. Similar sentiments greeted the Dolby Surround 2.0 soundtrack of Trekkies. Given its origins, one shouldn’t expect much from the movie’s soundfield. Most elements focused on the center channel. Speech and effects came from the middle. Music showed nice stereo imaging, though, and those pieces offered a nice feel. The surrounds slightly reinforced those aspects of the track but not much else, as they played a small role in the proceedings. Audio quality was solid. Despite some “on the fly” recording situations, speech was consistently positive. Although some lines were dodgier than others, all remained intelligible and usually quite natural. Effects played a minor role and seemed acceptable given the origins of the recordings. Music showed nice life and vivacity, as that side of things boasted good range. This was a perfectly decent track for a documentary of this sort. The DVD disappoints in terms of extras. We find the flick’s trailer and nothing else. If you want to see a mean-spirited take on “nerds”, Trekkies will disappoint you. Instead, it provides a rather even-handed take on its subject matter. Bolstered by plenty of interviews with Trek personnel, it digs into the “Trekkies” in a satisfying way. The DVD provides erratic but decent picture and acceptable audio but it lacks substantial supplements. The film would make a good rental.